Have you thought about a life without plastics? It may be difficult to adjust with such a life but if there is no plastic, then half of the issue due to pollution will be solved. We haven’t found a permanent solution for plastic pollution; even though studies have proved wax worms eat plastic. So it is better that we reduce the use of plastic in our life. Here in this topic, we will discuss about the steps to reduce the use of plastic and also few interesting facts about plastic pollution. 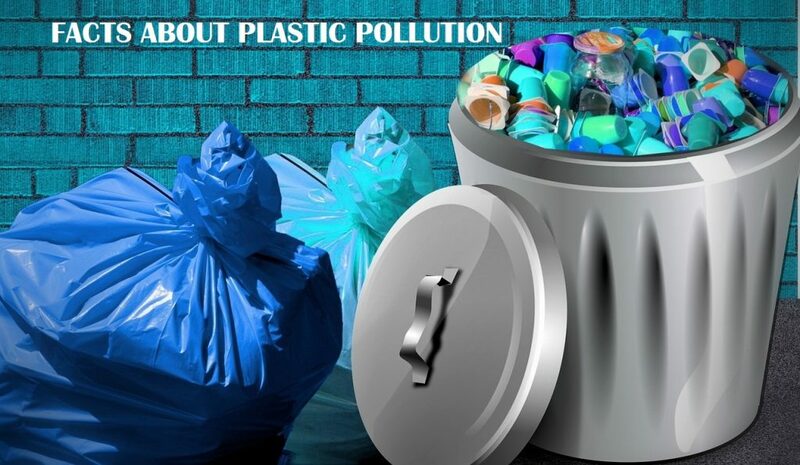 As the name suggests, plastic pollution is the pollution caused by plastics to the environment. Even though plastics are of great use, it can seriously cause harm to the environment. Over the years, plastics have become a part and parcel of our lives. It is impossible to live without using plastics. After the use of plastics, it is thrown away in the trash and finally gets piled up in the landfills. Mostly plastics are non biodegradable. In the landfills it is either buried or burned. If these plastics are burned, it can even worsen the situation. All toxins get absorbed by the atmosphere and increase the amount of carbon in the atmosphere. This in turn adds to global warming and drastic change in climate. Burning of plastics can also cause severe health issues in humans. Respiratory issues, skin allergies, lung disorders and cancer are some of the ailments caused. This topic deals with how to effectively minimize the use of plastics and some interesting facts about it. Stop the use of bottled water – all the bottled water globally comes in plastic packages. This water if filtered and stored in plastic bottles for easy storage. Even though it is convenient, these bottles are piled up after use. This can increase the pollution. The use of bottled water should be banned instead stainless bottled should be widely used. Carry own shopping bag – while going for shopping if we can all carry our own bags preferably made of cloth or recycled paper, the use of plastic bags will reduce immensely. Foldable and Reusable bags can be kept in the car and handbag regularly so the plastic bags can be avoided completely. Use reusable containers – it is always advisable not to store food stuff in refrigerators. It is best to store them in glass containers or steel containers. The leftover food or the take away food from the restaurants can be in reusable or recycled containers so as to reduce the use of plastic containers. Stop ice cream cups – the option of eating ice cream in cups can be avoided instead ice cream cones can be used to eat ice cream. This step can reduce plastic pollution. Buy milk in glass bottles – it is always a better option to buy milk and yogurt in reusable glass bottles or disposable paper bags. Avoid plastic spoons and cutlery – all these plastic spoons and cutlery should be banned completely as they are the worst pollutants. Mostly all these are for one time use and that usually pile up with trash. A set of wooden or steel cutlery can be used instead. Buy in bulk – all the cleaning products, hardware products; grocery and so on comes in plastic packages. So if these are purchased in bulk, packing material can be minimized. Return used containers – when we buy certain groceries or certain fruits directly from the farmers, it will be plastic containers. So after the use if it is returned to the farmers or manufacturers, the use of the plastics can be minimized. Recycle more – mostly all plastics can be recycled. But most of us do not take the effort to do so. It is easier to throw with the trash. If all of us separate the plastic waste and give it to the recycling industry, plastic pollution can be reduced considerably. Repair things – it is a common habit to throw away unused or old thing in the house. It is always better to repair than buy new stuff with plastic packing. Millions of plastic bags are used across the globe. The plastics do not degradate easily. More than 1 lakh sea birds were killed due to plastic ingestion. The amount of plastics that are thrown away globally can complete the circle of the earth upto 4 times. Plastic pollution is increasing by the minute. More than 50 percent of plastic pollution is swept to the sea. The plastic chemicals can be absorbed by the body. More than 95 percent of the plastics that were produced still exist. Around 1,20,000 tones of plastic dumped by the fishing industry. In the oceans, the plastic fragments into small parts. To make plastic bottles, nearly 24 gallons of water is used. More than 24 million gallons of oil is used to produce atleast one billion plastic bottles. Recycling plastics use very little energy as compared to making new plastics. Many species of fishes, other ocean animals and mammals are killed due to plastic pollution. The plastic that floats on the ocean surface will be around 50000 pieces every square mile. Fleece blankets and other fabrics can be made using recycled plastic bottles. As per a research done, it is believed that by 2050, there will be more plastics in the oceans than fishes. More than 85 percentage of plastic pollution in the river, sea and oceans comes mainly from land. Humans consume bits and microscopic plastics unknowingly. More than 60 percentage of plastics thrown are usually used only once. 35 billion plastics bottles are thrown away by Americans annually. These plastics have toxic elements and chemicals that can change the hormones and had negative effects in the health of humans. Certain countries like china, Ireland and Bangladesh have already banned the use of plastics. The global use of plastics is approximately 200 million tons. A jug made of plastic usually takes a million years to degradate. The largest ocean garbage is in the north pacific, off the coast of California. It is noted that the plastics floating in the sea in twice as the size of Texas. Recycled plastics can be used for innovative purposes like making trash bins, playground equipments, benches in the park, tarring the road and so on. Thus to conclude, plastic pollution is a global issue that should be given atmost priority. If all the above mentioned steps are followed, plastic pollution can be reduced considerably. The 3 R’s that is reduce, reuse and recycle should be effectively practiced. More people should be made aware of the issues caused due to plastic pollution. The government should make strict laws regarding the use of plastics. Dumping plastics should be completely banned. A pledge should be taken by all citizens of a country not to throw away plastics and give them to recycling centers. This in turn can save the environment and the natural biodiversity.